An on-the-ground report from the protests in Iran, where citizens are torn between anger at their leaders and fears of becoming the next Syria. Six months after Hasan Rouhani won his reelection in a landslide victory, dealing a blow to the hard-line elements of the political establishment, the nationwide protests in Iran that began on December 28, 2017 have spread like wildfire around the country. At the moment, the protests are leaderless, and the slogans vary from demands for economic equity to the freedom of political prisoners to the overthrow of the supreme leader to the downfall of the entire regime. They are different from the large-scale protests of the 2009 Green Movement. These protests are by and large taking place in cities, towns, and villages that have been on the margins of Iranian politics. Thus far, dozens have been killed and hundreds detained. Iran’s rate of inflation has fluctuated immensely in the past decade, and now stands at 17 percent. Scandals involving corrupt politicians and businessmen embezzling millions of dollars have erupted over and over again, angering citizens who are living month to month. Although Iran has a generally low rate of poverty, 4.7 percent in 2016-17, unemployment, particularly for youth and women, is above 30 percent. This, coupled with unfulfilled economic expectations — especially regarding the foreign investments that were supposed to flow after the signing of the Iran nuclear deal — were a powder keg. Rouhani and his administration hinged their strategy to improve the economy on sanctions relief and European investment in the country. Given Donald Trump’s promise to “rip up the nuclear deal,” foreign banks are now reticent to fund investment in Iran, and European companies are wary of entering a market that may be sanctioned further by the US Treasury. And, as Ahmad mentioned, Rouhani’s neoliberal economic policies, which include austerity measures such as limiting cash transfers, have caused anxiety. According to UCLA sociologist Kevan Harris, an extensive national survey in 2016 found that nearly all poor households were linked up with the cash transfers / yaraneh system started by former president Ahmadinejad in 2011, retrieving their funds from ATMs every two months., Rouhani and his economic team have now signaled they will cut back on the program. The new budget promises to cut off even more households from the program, creating further grievances. Indeed, President Hasan Rouhani’s new proposed budget bill, which he presented to parliament in mid-December, just weeks before the protests broke out, not only targeted cash transfers, but for the first time named a series of conservative clerical and cultural institutions that receive large endowments with little to no oversight. In a speech to parliament, Rouhani attacked these institutions, saying they were ruining the lives of millions of Iranians with their hefty budgets, and that the “financial mafia” in the country would wreak havoc on the country if it was not confronted. It seems that in the weeks following this speech, hard-liners — especially in the city of Mashhad, one of Iran’s largest cities and also the home to Rouhani’s rivals in the presidential election — triggered protests that they hoped would culminate in the pre-planned annual regime rally of 9 Dey, which celebrates the suppression of the Green Movement. The protests were supposed to be anti-Rouhani — a reaction to the rising cost of eggs, and to rumors that gasoline prices would be doubled in the coming Iranian year. It’s hard to overstate the factionalism of Iranian politics. Long a feature of the Islamic Republic, differing factions within the Islamic Republic have often publicly fought and debated one another on policies and directions for the country. During Rouhani’s terms as president, the hard-line elements in the regime have attempted to create obstacles for him and his administration at every turn. Especially since their embarrassing loss in the May presidential elections, hard-liners have attacked Rouhani at every opportunity. For his part, Rouhani has attempted to curtail the economic power of hard-line institutions and has sought to push the Revolutionary Guards out of politics, with little success. In the middle of this fight, former president Mahmoud Ahmadinejad has made a surprise comeback. In November 2017, Ahmadinejad started issuing provocative statements against corruption and began to ask why, if the country’s money belonged to the people, the government was targeting funding for the people’s welfare. Using social media as his main tool of communication, Ahmadinejad issued threats against Iran’s judiciary, challenged Iran’s supreme leader by not backing down when asked to, and revived the populist message of his presidency, attacking the rich and corrupt. On Wednesday, the commander of the Islamic Revolutionary Guards Corps announced that “a former leader of the country” had provoked people to protest. Some in Iran are now reporting that Ahmadinejad is being investigated. In a move typical of the Islamic Republic, once the protests began to gain steam and spread from one location to the next, the regime slowed down internet speeds to disrupt communication and specifically targeted two social media sites that are popular in Iran, Telegram and Instagram. Telegram, in particular, has been heavily targeted, as it’s the largest messaging app in use in Iran today. Unlike the 2009 protests, however, state television — which is mainly in the hands of the hard-liners, and thus against Rouhani — has featured news about the protests and in some cases has even attempted to focus the conversation solely on Rouhani’s economic policies, without mentioning the protest slogans against the supreme leader or the regime as a whole. Meanwhile, there’s the problem of doctored images and videos taken from earlier protests being passed off as the current Iranian demonstrations. For example, images of Bahranian protests from 2011 have gone viral on social media as footage of protests in Tehran, while photos of wounded or dead protesters from Egypt’s revolution are being passed off as images from Iran. 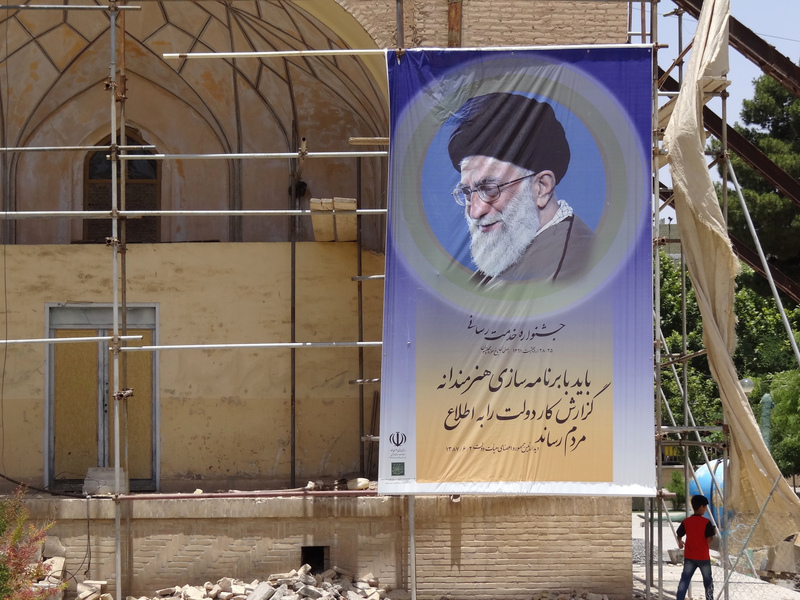 Iran has a long history of foreign involvement in its internal affairs. In this increasingly volatile time in Iran’s politics — and an increasingly fraught and bloody period in the modern Middle East — the role of outside forces can’t be ignored. Iran’s supreme leader has predictably fallen back on his favored accusations of outside meddling in Iran’s internal affairs. He has blamed outside money and weapons for these protests, completely ignoring their very real grassroots origins and the grievances of the participants. Nonetheless, it would be naive to think that parties such as Saudi Arabia, Israel, and the United States, and the opposition groups they support, aren’t either involved on the ground or pining to be, in order to swing events in their favor. “But what if foreign parties are involved? Do you want to turn Iran into Syria? !” Shayda asked angrily. “It’s never the right time. I’m tired of waiting for the right time,” Mohsen responded, as he turned his attention to his cell phone — coordinating with Meysam about when they would go out into the streets tomorrow. Narges Bajoghli is a postdoctoral research associate in international and public affairs at the Watson Institute at Brown University.